Below is a diagram that shows the sequence of events used in accessing data in Metric Insights from your website. To enable access to your website you must first configure Metric Insights with the certain security measures such as shared secret information and a whitelist of external hosts that are cleared for access. Choose Add New External Application button. Give your external application a name. 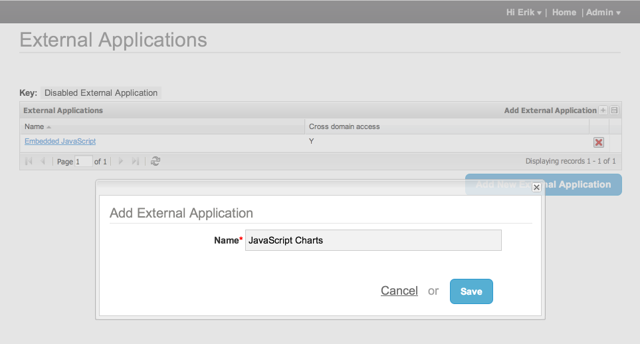 To give your external website access to Metric Insights, you need to select Cross Domain Access. Click "Yes" for Cross Domain Access radio button. 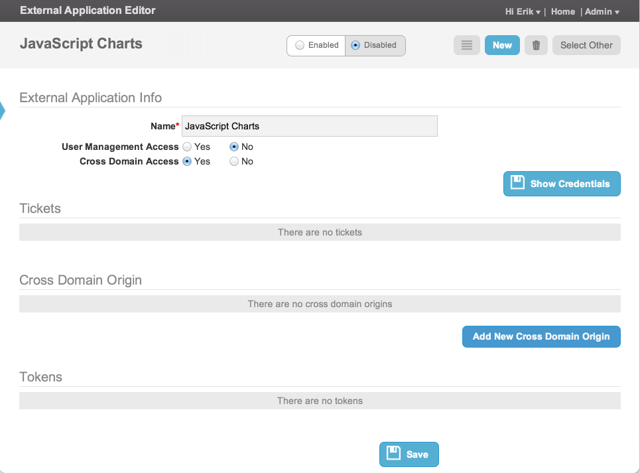 Once you do that, the screen will show you a Cross Domain Origin section with a button to Add New Cross Domain Origin. 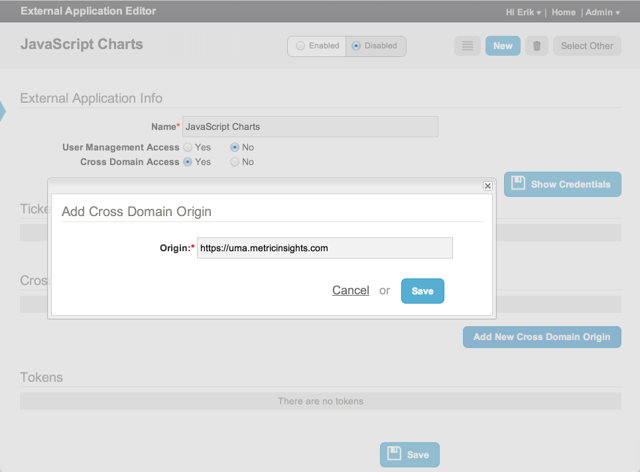 Click this button to add Cross Domain Origin. Add the name of your website. This is the fully qualified domain name (FQDN) including the protocol. I.e., include the http(s):// for your website domain. Click Save when done. Back on the External Application Editor, enable the external application by clicking on the Enabled radio button at the top of the screen. Then click the Save button at the bottom of the screen to save. 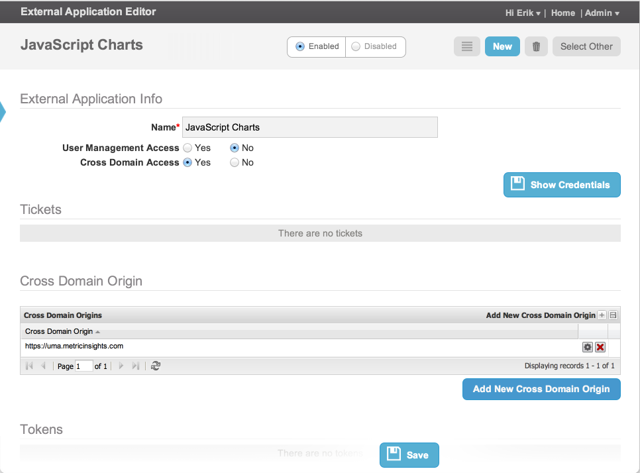 On the External Application Editor click on the Show Credentials button to get the shared secret information that will be used by your website to securely get data from Metric Insights. Once you click on that button, the button label toggles to say Hide Credentials. The shared secret information that displays includes the Application Id and the Application Key. When done, click the same button which is now labeled Hide Credentials. 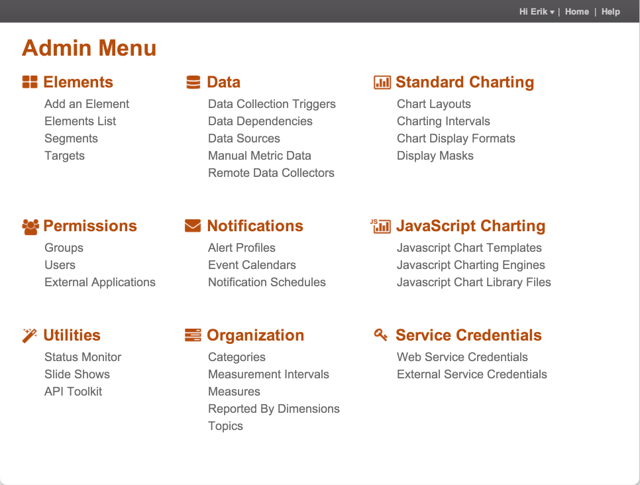 Now you are ready to access Metric Insights data from your website. 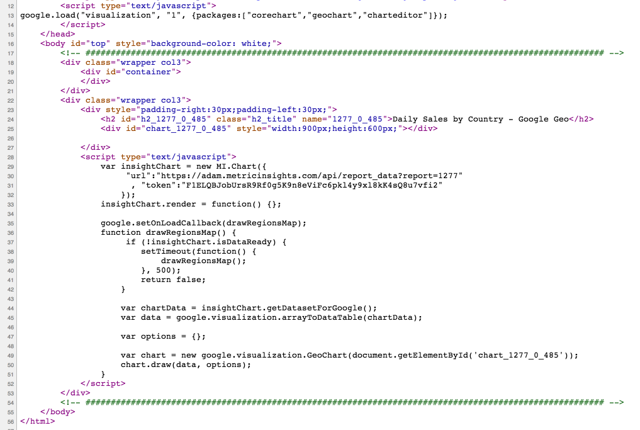 You just need to add the code to your website to fetch the data from Metric Insights. In general, fetching the data is a two step process. First you make a "get token" API call to get a token that gives you secure access to the data. 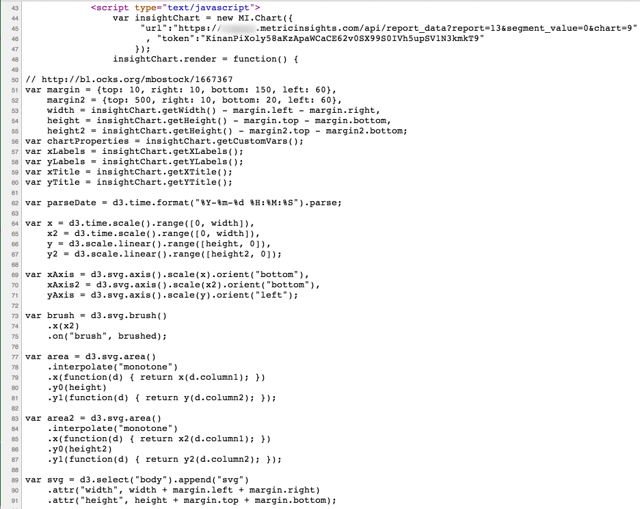 Then you make a "get data" API call using this token to get the data. Once complete, you can then chart your data, or do anything else you want with the data. Get the secure token from Metric Insights. To get the secure token, you make a "get token" API call to Metric Insights. 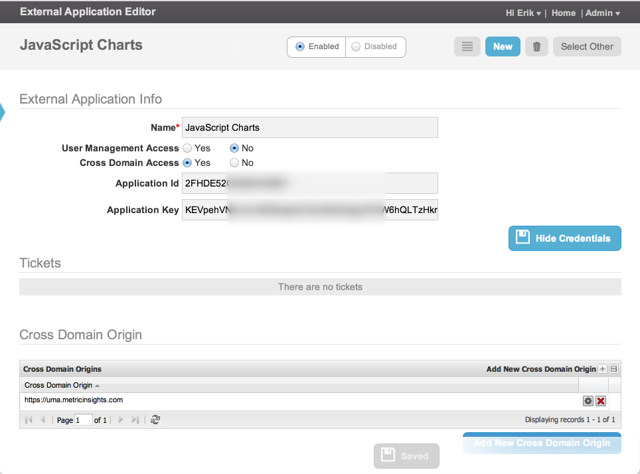 You supply the "application_id" and "application_key" generated in the above steps when configuring external access for Metric Insights. You also supply an existing User via "user". The token value is then returned. Below is an example of the API call using curl at unix command line. Get the report data from Metric Insights. Other variations of invoking the API call to fetch report data from Metric Insights are listed here. This includes specifying the pivot table, the Dimension value and/or the specific chart.